The Way of Shambhala is a path of training in authentic meditation practices and the wisdom teachings of Tibetan Buddhism. This programme of evening courses and weekend retreats offers a continual deepening in practices and teachings rooted in the ancient traditions of Shambhala and Vajrayana Buddhism. It is open to people of all religious backgrounds or no religious background. It is recommended for beginners and experienced meditators as well as those looking for a genuine spiritual lineage offering personal and societal transformation. We welcome you to participate to the extent you wish. Sample a course or a weekend retreat—or a number of them—at any time. Way of Shambhala also offers meditation retreats and advanced assemblies to strengthen your practice and understanding. For information about those retreats, please see The Shambhala Path on Shambhala’s International website. You may start with any series except the Sacred Path. In each series, the courses or weekend retreats are designed to be taken in order. 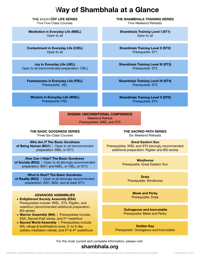 For example, Shambhala Training participants progress from Level I to Level V in sequence. As meditation practice expands and we develop trust in basic goodness, we can begin to discover the confidence and personal energy to go forward on the journey. Joining gentleness with discipline leads to a sense of joy. 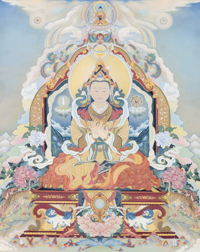 The Mahayana teachings on compassion can become the inspiration for a life of bravery and freedom from doubt. Open to anyone with an existing meditation practice (we recommend completing Contentment in Everyday Life first, though you may also have completed and eight week MBSR course, or have previous experience of Buddhist Meditation. The Basic Goodness series introduces the view of Shambhala in an experiential way. The key difference between the Everyday Life courses and the Basic Goodness courses is that the Everyday Life courses emphasise personal practice for transformation in daily life, whereas the Basic Goodness courses emphasise the teachings and view of Shambhala Buddhism. The Sacred Path series is a sequence of advanced Shambhala Training weekend retreats based on the unique inner teachings of Shambhala. You may start the Sacred Path series any time after completing Shambhala Training Levels I–V and the Everyday Life series. The Rigden weekend retreat and Basic Goodness series are strongly recommended additional preparation. The Sacred Path series is not prerequisite for Enlightened Society Assembly but is prerequisite for Warrior Assembly.